The “everyone” who wanted to go to Baghdad was actually just the Neocons and their fellow travelers. Most of the latter were hoodwinked by the Neocon/Cheney misinformation campaign blaming Saddam Hussein of Iraq for 9/11. A majority of Democratic representatives in the lower house of Congress voted against the idea of going to war. The Iraq War, trumped up on false pretenses and mainly to protect the militant right wing in Israel from having a credible military rival in the region and to put Iraqi petroleum on the market to weaken Saudi Arabia, cost the United States nearly 5000 troops, hundreds more Veterans working as contractors, and probably $3 or $4 trillion– money we do not have since our economy has collapsed and hasn’t recovered except for wealthy stockholders. Perhaps George W. Bush could paint for us some dollars so that we can remember what they used to look like when we had them in our pockets instead of his billionaire friends (many of them war profiteers) having them in theirs. I’m basing my arguments here on the White House’s fact sheet on the deal, and while admittedly words are less compelling than actions, it must be stressed (particularly to the hair-on-fire crowd) that they just agreed to this damn thing last night, so words are really all we have to go on just now. For another thing, this agreement is only a six-month cooldown to open time and space for negotiations on a permanent settlement. I suppose the particularly demented could have expected the Iranians to give up everything in exchange for a small amount of sanctions relief, but this is why you don’t let crazy people with unrealistic expectations conduct negotiations, no offense to Senator Cruz personally. Let’s see what the Iranians have to trade away to get a final deal, then you can all start screaming about Hitler and Chamberlain and the like, OK? While I don’t think anybody disputes that the rest of the world aside from Iran itself would be better off if the Iranians stopped enriching uranium altogether, that was never going to happen. You can get a deal that gets Iran to pledge to cap enrichment at 5% and allow substantial inspections to ensure compliance, or you can get no deal and Iran gets the capacity to make a bomb and you get airstrikes or a war. Take your pick. No wait, John Bolton is one of you guys, so don’t pick, because I could see him start drooling the minute I said “war.” An insistence on zero enrichment will kill these negotiations, period. Fair question. If I had to guess, I would say that, despite the freeing up of some $7 billion in frozen assets that can now be repatriated into Iran, the Iranians might still have a tiny motivation to get a deal done in the form of the roughly $100 billion still remaining in frozen Iranian assets. Plus they might want to see an end to the continued sanctions on Iran’s banking and oil sectors that are the real crippling elements of the sanctions regime, you know, maybe. Or maybe I’m wrong and this particular $7 billion had great sentimental value for Ayatollah Khamenei, or something, and now they’ll quit here and leave the other $100 billion on the table with all the harshest sanctions still in place. That’s the dumbest thing the Israeli government has said about this deal so far, and maybe the dumbest thing anybody has said about any international negotiation, ever, but I’m betting that Netanyahu and Regev can top it. Don’t let me down, guys! So, here is the leading nation state of terror who tried to commit a political assassination right here in Washington, D.C. [ed. note: needless to say, there’s plenty of reason to be skeptical of this claim] as they believe can contribute to the deaths of hundreds of U.S. Soldiers in Iraq and Afghanistan [ed. note: this is undoubtedly troubling, almost as troubling as the tens of thousands of Iraqis and Afghans we’ve killed for reasons we can’t even attempt to articulate anymore], who continues to be the main driver between the incredible brutality that’s happening in Syria, very active around the world with other political assassination attempts and what have we done? We’ve taken away the one thing — we’ve given them just enough breathing room, the one thing that brought them to the table. Well, yes, we took a little bit of that thing away, because, you know, we achieved part of the purpose behind imposing those sanctions in the first place. Typically sanctions and other acts of war are means to another end, not ends in themselves. I get the feeling that folks like Mike Rogers and John Bolton would gladly trade letting Iran have a nuclear weapon for the justification to starve a whole bunch more Iranians, or (OMG) to actually go in there and bomb the crap out of them. I know that when I want informed opinion about difficult geopolitical situations, I look for someone who’s got the kind of aptitude for diplomacy that you need to threaten a lawsuit because Forbes didn’t rank you high enough on their annual list of gigantic pricks billionaires. Prince Al-Waleed is the fellow who offered a $10 million check to New York City after 9/11, along with his unsolicited opinion that America had brought the attack on itself, and then when his check was shockingly rejected blamed The Jews. Swap this guy’s keffiyeh for a frightening hairpiece and let him take over as the host of Al-Idara Jadara and he’s the Saudi version of Donald Trump. 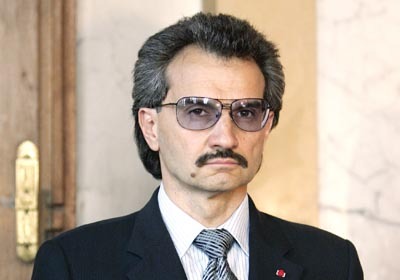 OK, since the prince is worth multiple times what Donald is worth (in fact, he bought his yacht from Trump during one of The Donald’s many bankruptcies), maybe it’s better to say that Trump is the American version of Al-Waleed. Anyway, the prince was saying? See above. Is the point to prevent Iran from developing a weapon or just to keep levying sanctions on them forever and ever? He went on to condemn Obama for folding when confronted with proof that Syria, Iran’s proxy, used chemical weapons against civilians. Obama had previously warned Syria not to cross the red line he drew on the deployment of chemical weapons. Oh, I see. The point, then, is that America should do what the Saudis want and fight whomever the Saudis want us to fight. Gotcha. If the negotiations don’t succeed — and clearly, Alwaleed sees no chance of success — then what? Anti-proliferation by force? I asked him if he thought the Arab states would actually back an Israeli strike on Iran’s nuclear facilities, if this terrible option should come to pass. What about at the level of the so-called Arab street? If there’s anything a billionaire Saudi prince who owns three palaces knows, it’s what “the Sunni Muslim” wants. What “Persian empire,” you ask? Who the hell knows! The last “Persian empire” that wasn’t Muslim was wiped out in the seventh century! By the “Muslim Arabs”! It’s nice to know that there’s ultimately nothing ideologically separating this sophisticated, cosmopolitan Saudi billionaire from the takfiri nuts who bomb Shiʿa mosques in Iraq and Pakistan. If this is the kind of person who opposes this deal, then, at the risk of jumping to conclusions, it must be an OK deal.